Cholent season has officially begun. By that I mean it’s raining, it’s pouring, we’ve had nearly half a winter’s worth of rain in about two weeks. 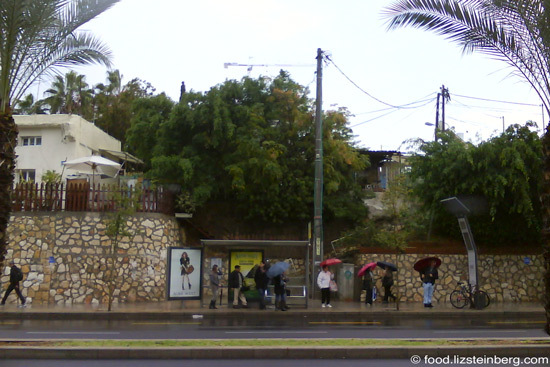 This is what an average day has looked like in Tel Aviv, that is, during the hours when it’s not pouring and the streets have turned into rivers flowing more rapidly than the Yarkon at most times of the year. And if that’s not bad enough, Katherine and I visited Ariella in Jerusalem. There, not only the streets were rivers; the sidewalks were, too. So that’s my case for a steaming-hot brunch that you set up a day in advance and let simmer all night, filling your house with warm smells. I generally close the door to the kitchen; otherwise we’d be waking up and drooling all night long. Cholent, by the way, is the Yiddish name, but this dish is not exclusive to Ashkenazi communities. Many different Jewish communities have their own version, since this cooking technique gives you hot food on a day when Jews traditionally don’t cook. It’s called hamin in Hebrew. Based on the word for hot. It sounds warm and cozy to me. 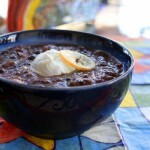 The base of cholent is slow-cooked beans. 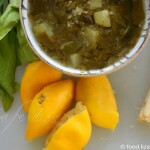 The long cooking time lets all the flavors blend and caramelize. Actually, I’m not sure whether they’re caramelizing or doing something else in there, but the flavor definitely is nothing like what you’d get by throwing everything into a pot and cooking only until soft. Cholent is traditionally made in the oven, baked at a low temperature (100 to 120 degrees Celsius), or left on a Shabbat hot plate. I make my cholent in a 6-liter slow cooker (crock pot), which seems to work just as well. The big challenge when making vegetarian/vegan cholent is finding ways to pump up the flavor without using meat. To me, this mix of flavors fits the bil. The usual suspects — beans, barley, potatoes, onions — are supplemented with coriander, cumin, bay leaves and freekeh, ideas that came from Phyllis Glazer’s recipe for Ynet (in Hebrew). Phyllis explains that coriander and cumin aid digestion, which sold me. I also added a pinch of asafoetida for good measure (Wikipedia defines it as a “digestion aid and antiflatulent”). It or the spices did the trick. As for the freekeh — smoked wheat berries — it adds a lovely chewy texture and layer of smoky flavor that goes well with this dish. I use whole freekeh, as opposed to cracked wheat. If you don’t have any, you could use plain whole wheat berries instead. Hard-boiled eggs are a traditional addition to cholent, but they’re my least favorite part, so I left them out. If you want, you (non-vegans) could nestle some clean eggs, in their shells, into the pot among the other ingredients. Traditionally, it’s one egg per person. For those who want to experiment, other things I’ve seen in cholent recipes include: all sorts of legumes, root vegetables (sweet potatoes, Jerusalem artichokes) and other vegetables that can sustain prolonged cooking, dried fruit, and beer or wine. I haven’t had good success using delicate leafy greens such as spinach and fresh herbs, but if someone wants to serve me a version that proves my preconceptions wrong, I’m ready and waiting. I’m embarrassed to say how many servings it made for us in practice. So yes, let’s say this makes 6-8 servings. Prep time: 15 minutes. Cook time: 12 hours or overnight. Note: This recipe takes lots of advance preparation. The pot goes on the flame about 12 hours before you want to eat, and the beans should start soaking at least several hours before then. Also, you need a slow cooker, an oven-safe pot or a Shabbat hot plate that will be on all night, as well as a cloth cooking bag. Let the beans soak in advance. Ideally start them a day in advance, so they can start to sprout (soak 8-12 hours, then drain, and rinse every few hours for the remainder of the time). 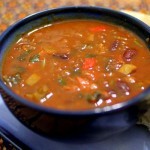 I like keeping different kinds of beans separate, because I arrange them in different parts of the pot. Note: If you forget to soak your beans, no big deal; they’ll cook anyway. Arrange all the ingredients in the pot: I like to coat the bottom of the pot with beans, with each kind on its own side, and then pile the barley in the middle. Arrange the potatoes on top of the legumes, add your spices, and top with carrots, tomatoes and the fried onions. Nestle the bag of freekeh into the mix, so that it is level with the top layer. Top off the pot with enough boiling water to cover everything — about 2 liters. At this point, many recipes call for bringing the pot to a boil on the stovetop, but I just turn my slow cooker on (it took 2 hours for it to start boiling). Start cooking your cholent via your method of choice — in the oven (at 100-120 degrees Celsius), in a slow cooker (automatic setting), or on a hot plate. Slow cookers and pots on hot plates may be covered with a kitchen towel or two to improve insulation (my slow cooker was nowhere near hot enough to start a fire, and the towel quickly became damp from escaping steam). Serve, scooping out the different kinds of beans from the different areas in the pot. Add a few spoonfuls of the freekeh to each serving. * Different kashrut authorities vary regarding the restrictions on adding hot water into a pot of cooked food during the sabbath. I consulted with a kashrut supervisor who found a source saying that Ashkenazi rabbis generally believe it is allowed (the case at hand specifically was boiling water and cholent), while some Sephardi rabbis say it is not because it may violate the restriction against cooking during the sabbath (the water may heat up and be cooked). If this issue is relevant to you, you could get around this problem by adding hot water to the cholent once it is not on the flame anymore, so it will not have any chance of cooking. 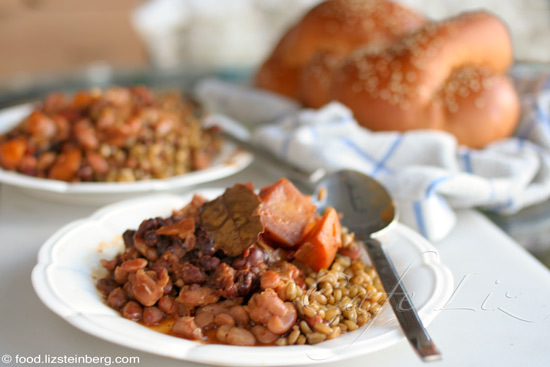 For more: An interesting article about cholent in Jewish Magazine. 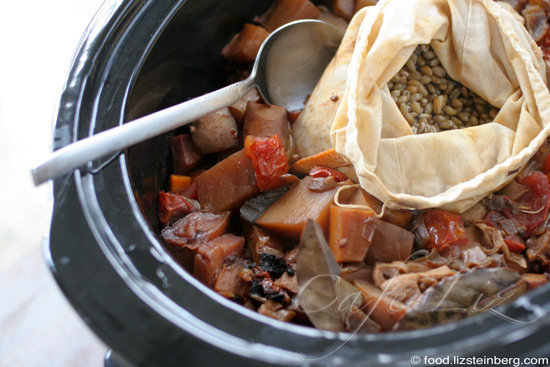 20 Responses to "Vegan slow-cooker cholent with legumes, freekeh and spices"
Yum! Can I call it hamin though? Katherine, I was still soaked when I got back to Tel Aviv! Which was especially strange, because in Tel Aviv there wasn’t a cloud in the sky. You bring up an interesting point — are we maybe understating serving sizes based on what we believe a “normal” person would eat (i.e. someone who eats this dish with a side salad and maybe some bread, and who doesn’t come back for 4 servings in 3 hours). On the other hand, this weekend we did indeed eat only “normal” servings and thus I have an absurd amount left over. It looks and sounds delicious, Liz. I will try this soon. Greetings from Finland! Ooh, smoked wheat. I don’t think I’ve ever seen freekeh, but from the sound of it, I think we’d make fast friends. This recipe sounds great, and I will definitely give it a shot with wheat berries. Do you buy freekeh in the shuk? I heard about freekeh on one of my favorite podcasts – KCRW’s Good Eats, out of Santa Monica California. Hey Yosefa, for some reason I’ve lost the ability to respond to comments! So I hope you get this — yes, I buy freekeh in the shook, either in the Carmel market or Levinsky. Liz, can you please give a Hebrew translation for asafoetide? I can’t seem to find it anywhere. Candy, I think it would just be called asafoetida, though I found the Hebrew name is haltit. It’s uncommon here, but maybe East West would have it. I’m pretty sure I’ve seen it in Indian stores — there’s one at the Tel Aviv central bus station, and a few in Ramle. I located some freekah this weekend and am really excited to give this recipe a shot. So happy I mentally filed it away for when I found all the ingredients. How about adding the greens towards the end if the cooking time?